Currumbin is located on the coastline between Tugun and Palm Beach offering a beautiful and scenic beachfront featuring the exposed rock formations of Currumbin Rock and Elephant Rock. Beside the popular scenic spot of Currumbin Rock, is the hugely popular surfing spot, Currumbin Alley, which leads into Currumbin Creek and heads inland through Currumbin Waters to its origin at the magnificently scenic Currumbin Valley at the foot of the Hinterland region. 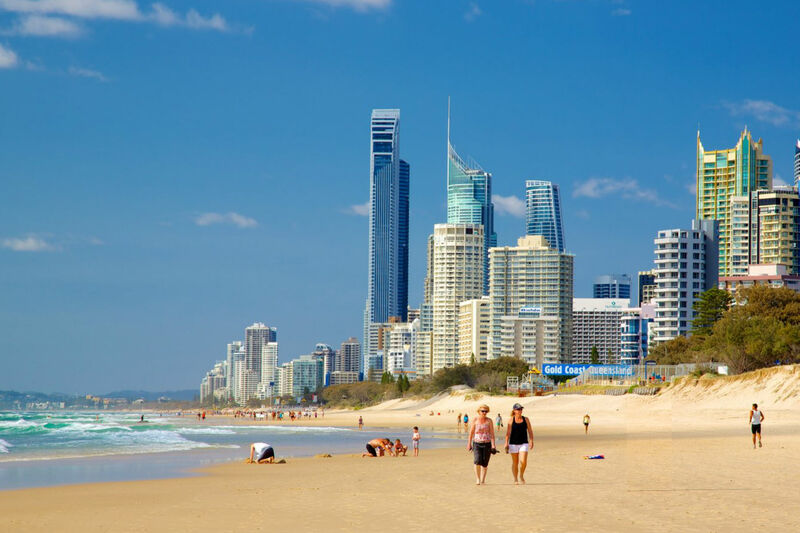 At Currumbin and near to the beachfront, you’ll also find a major attraction of the coast, Currumbin Wildlife Sanctuary, and also Superbee Honeyworld and Surf World surfing museum. There is plenty of fishing done in Currumbin Creek along with casual boating, and if you follow Currumbin Creek Rd inland to Currumbin Valley you’ll come across the famous rock pools which are a popular spot on a summers day. 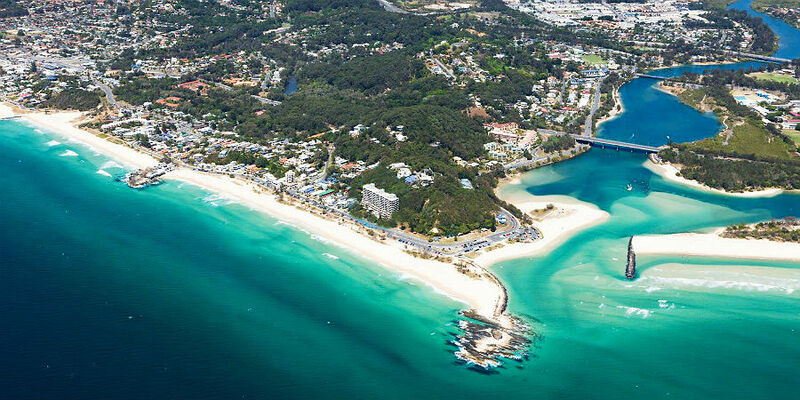 Currumbin beach is a 750 m long, north-east facing beach that extends from Currumbin Rock down to Elephant Rock. This area is one of the most popular beaches and recreation areas for locals and you’ll find it gets busy on weekends. Around the inlet to Currumbin Creek near Currumbin Rock, you’ll find loads of surfers catching the waves in the morning and late afternoons. 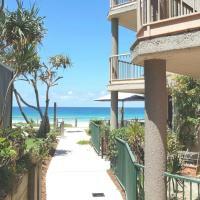 This is also a very beautiful spot at sunset with views all the way to the highrises of Surfers Paradise. Please visit Beachsafe for Lifeguard hours and conditions. For live Currumbin Beach surf cam see CoastalWatch. The 24 kilometre Currumbin Creek is a peaceful river that is popular with kayakers, jet skiers, boat-goers and fishermen. There is a walking/bike track (part of The Gold Coast Oceanway) that begins at Marlin Waters Park on Bradshaw Drive and follows the creek all the way to the beach. At Preston Park you’ll find a BBQ and boat ramp, at Apex Park there is boat hire at GC Watercraft, and at Winders Park, there are playgrounds and more BBQ’s. Located in the scenic Currumbin Valley and about 15 minutes by car from central Currumbin is the very popular local swimming spot, Currumbin Rock Pools. There is a large swimming hole and several shallow swimming holes along with a grassed area for picnics, sheltered seating, BBQ facilities, and toilets. Across the road, there is the Gallery Cafe which has fresh food and coffee opening from 10am to 4pm. 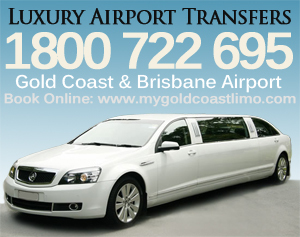 Located on Currumbin Creek Road near the intersection of Reynolds Road. 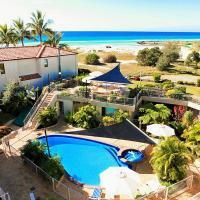 Offering direct beach access they offer indoor pool, bbq facilities, large two bedroom apartment with full kitchen and laundry facilities. 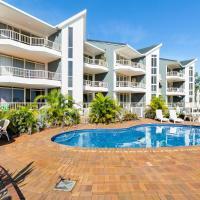 Offering large two bedroom apartments that are fully self-contained with kitchen, fridge, and laundry. They also offer pool and spa. Offering large two bedroom and three bedroom apartments that are fully self-contained with kitchen, fridge, and laundry. They also offer direct beach access, salt water pool, and spa.